Greetings from Miami, where it doesn’t feel much like Christmas, even with all the strings of twinkling lights wrapped around the palm trees. Nan, Scout and I have been here for over a year now, long enough to experience all the seasons, and there isn’t much of a difference from one to the next. We’re enjoying the cooler, drier "winter" weather right now but dreading the heat and humidity just a few short months away. Maybe we need a trip to Colorado or Wisconsin to regain our perspective. It has been a transitional year. Nan’s mother, Mary Claire Mullins, passed away at the end of May at the age of ninety-one. She lived a fully engaged life, dedicated to her family, her church and her many causes. It was her wish to live out her days in the home she and her husband Jim shared with their twelve children in Manitowoc, and she was able to do so with the love and support of her family. John has continued as a software engineer for CareCloud, an up-and-coming healthcare information company located here in Miami, and Nan has volunteered her time and talent at Baptist Doctors Hospital in Coral Gables. Scout still gets plenty of attention, with morning and afternoon walks through shaded neighborhoods to the bayfront and the local dog park. 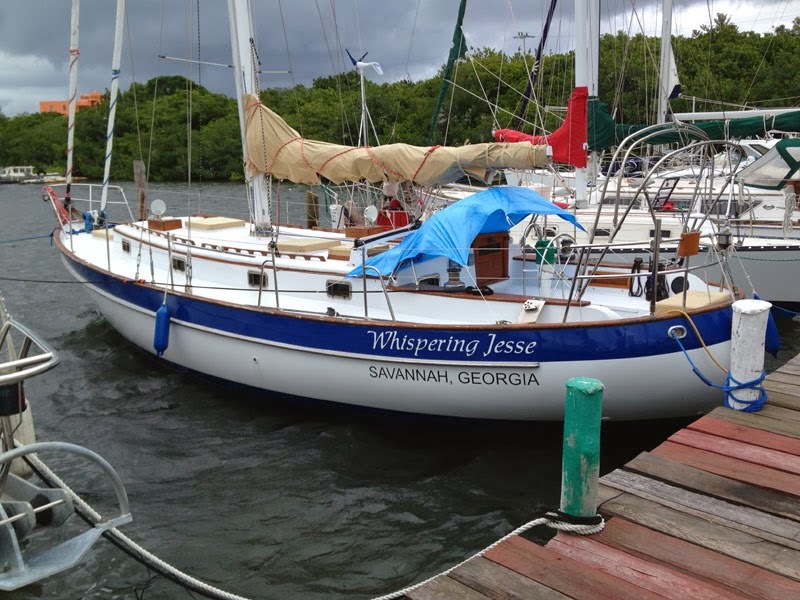 Our sailboat, Whispering Jesse, has been moored at the Coconut Grove Sailing Club since late May, after an uneventful six-day sail up from Isla Mujeres, Mexico with friends Mike, Kevin and Paul. 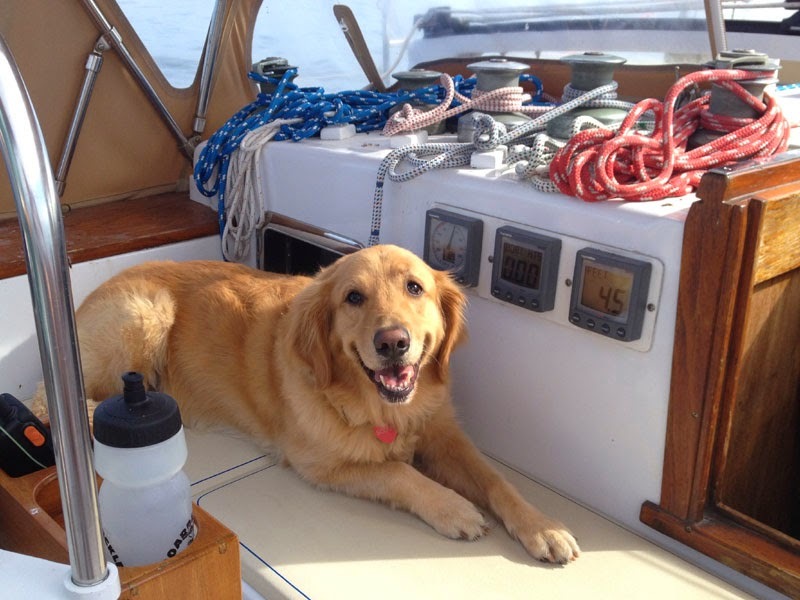 Newly added improvements make the forty-foot boat more easily sailable by a small crew, and we have been taking advantage on weekends, exploring Biscayne Bay and trying to give Scout his sea legs. 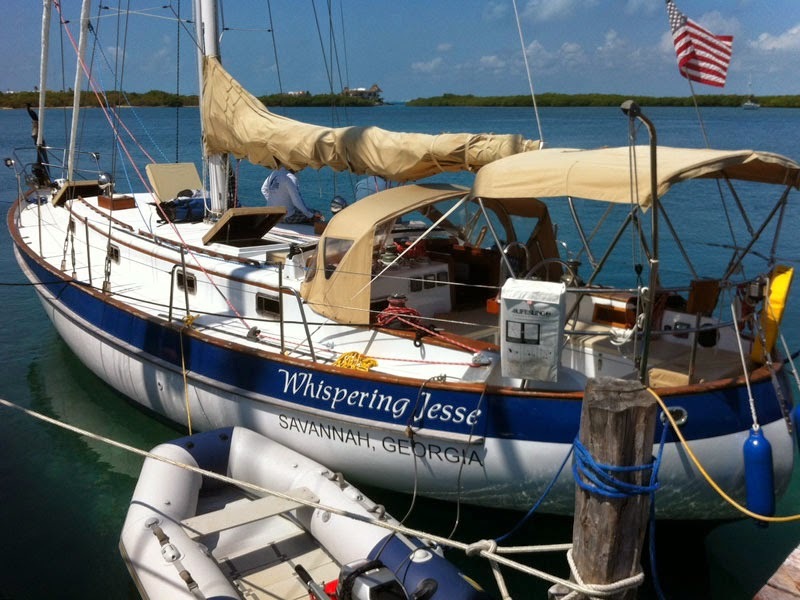 A few weeks ago, we boarded Scout and sailed to no-dogs Boca Chita State Park for an overnight, but all the tie-up spots were already taken, so we sailed farther south and anchored off Elliott Key. It was such an enjoyable experience that we’re going back on Christmas Day for a two-night stay, and taking Scout this time. June 2 marked our twenty-fifth wedding anniversary. 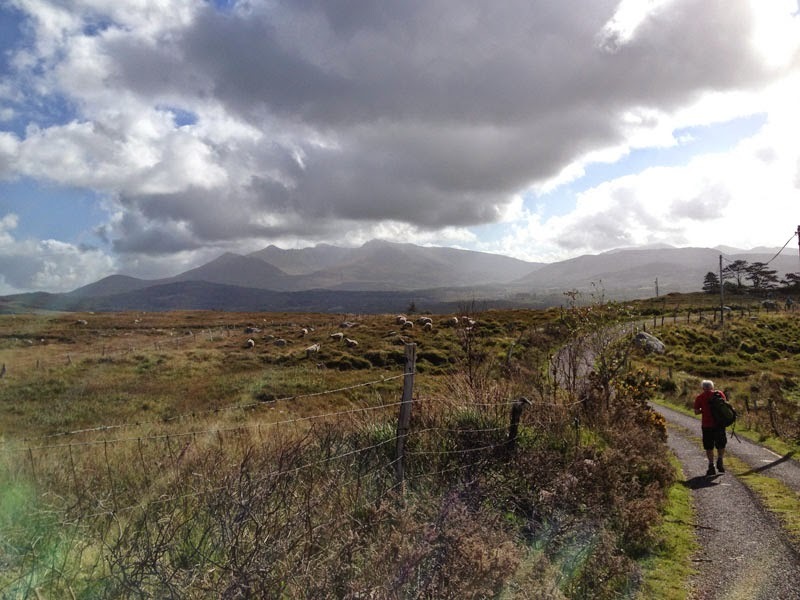 We celebrated in September with a trip to Ireland for sightseeing in Dublin, followed by a week-long Wayfarers walking tour of the Ring of Kerry. With her Irish heritage, the Emerald Isle was a place Nan had always wanted to visit. Her sister Monica and Monica’s partner Vicky shared the adventure with us and chronicled it in photos. Many are in a slideshow on our blog at whisperingjesse.com. We’re off to Isla Mujeres again in a few weeks to celebrate Nan’s milestone birthday. Not to say, but you can guess which one this is. It was her choice to return to Mexico, and she already has her big day entirely planned out, if we can squeeze it all in. 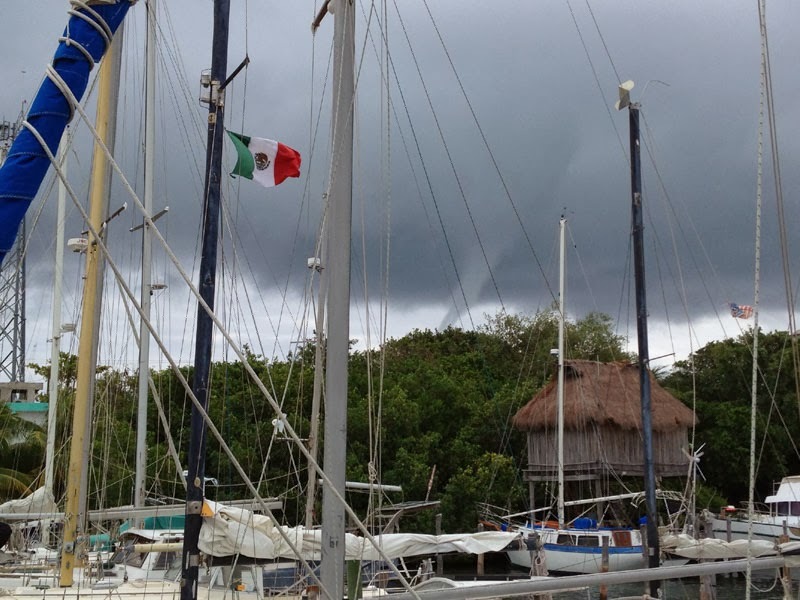 It will be fun to visit in January after learning about Mexican summers during our three-month sojourn there last year. These are interesting times, and it is easy to lose sight of what really matters. We wish you peace, prosperity, and the time to reflect during this holiday season. 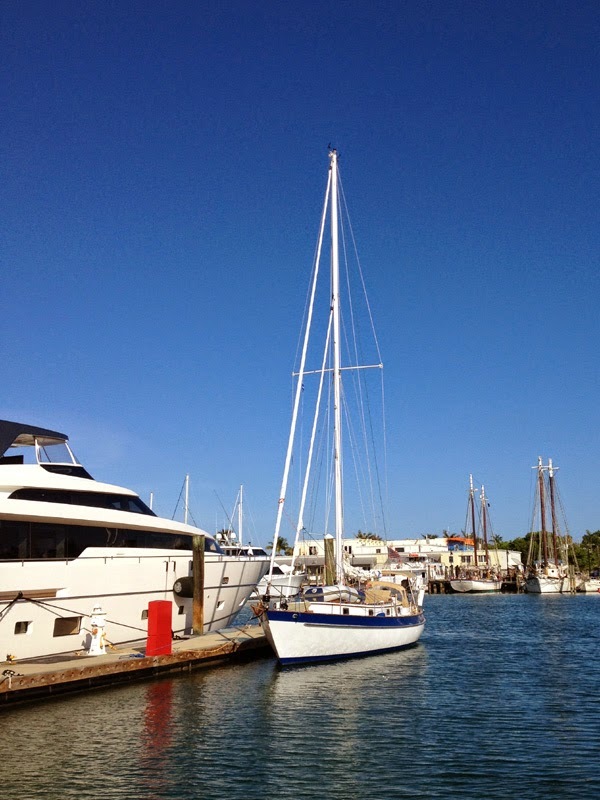 The two issues that came up when we finally took the boat out sailing after finishing the installation of the Cradle Cover--the engine fuel leak and the marine growth on the hull--have been resolved. At Ralph's suggestion, I bought a set of tube, or flare, wrenches and used one to tighten the nut on the injector tube, but it didn't stop the leak. Our friend Pompeii, who has many years of diesel engine experience, tried his hand at it and couldn't stop it either. He recommended replacing the injector tube and told me I could order one from Tradewinds Power, a local Perkins diesel engine supplier. I was a little dubious, but the part was not so expensive that I didn't want to give it a try. Well, it was like doing a complex Chinese puzzle inside an overheated sauna to get the old tube out and the new one in, but it worked. There are no more leaks. But I somehow managed to interfere a little with the free running of the plunger cable that chokes the engine to shut it off, not so much that it doesn't slide the way it should, but now it's a little grabby. I will dig into that more when the weather cools down some. Patrick, the water taxi driver at the Coconut Grove Sailing Club, gave me the business card of Mary Anne, a local woman who runs a hull cleaning operation. She coordinated getting one of her people to clean all the accumulated marine growth off the hull and install two new zincs on the propeller shaft. What a difference having a sleek hull again has made! Heading out the Dinner Key channel now, the boat is at least two knots faster at the same engine RPMs. 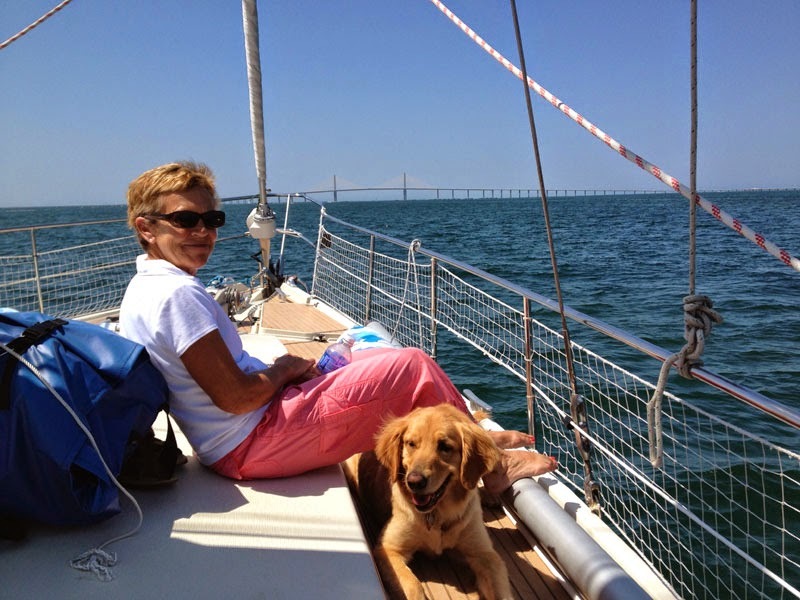 Nan took the two-day US Sailing basic keelboat class at CGSC a couple of weekends ago, so she wasn't available to join me for a sail. 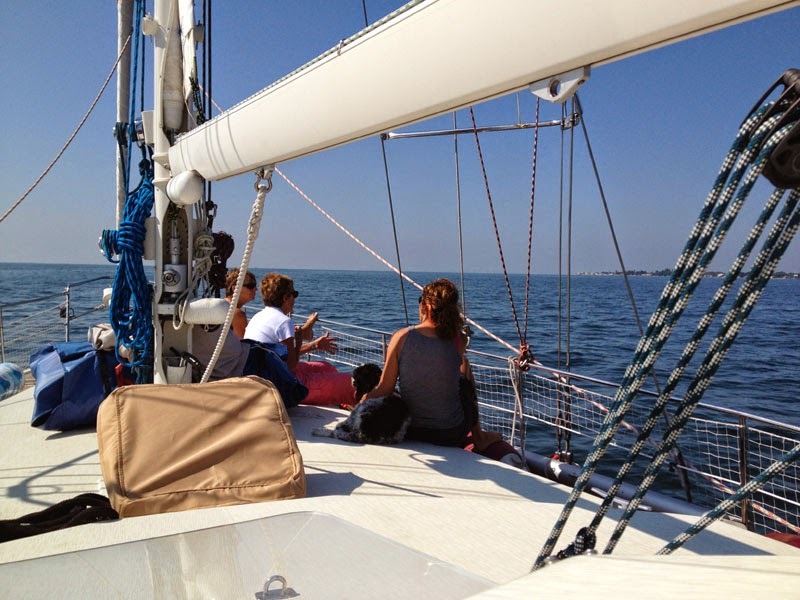 I talked her into letting me go sailing by myself instead by convincing her that I could leave and return to our mooring safely. 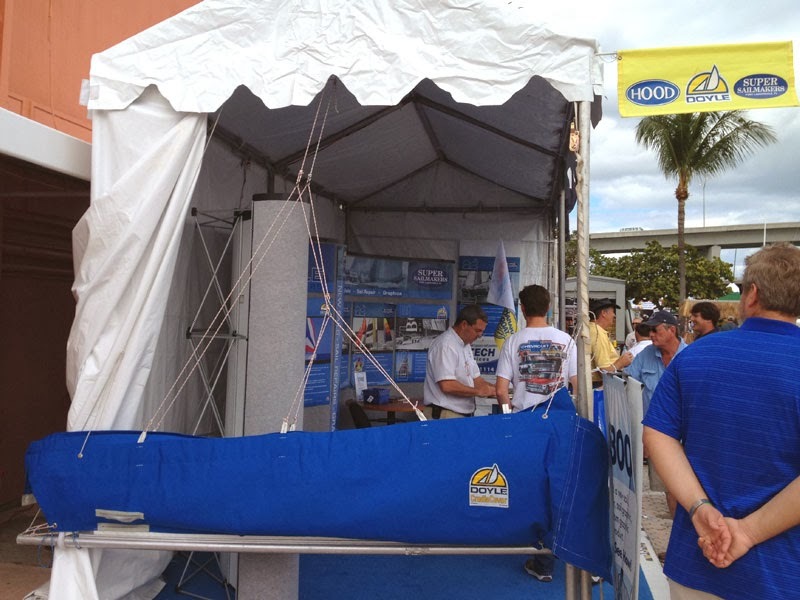 I had researched ways to cast off a mooring from the cockpit and purchased a length of Floatline from Defender.com to help me facilitate a clever technique. 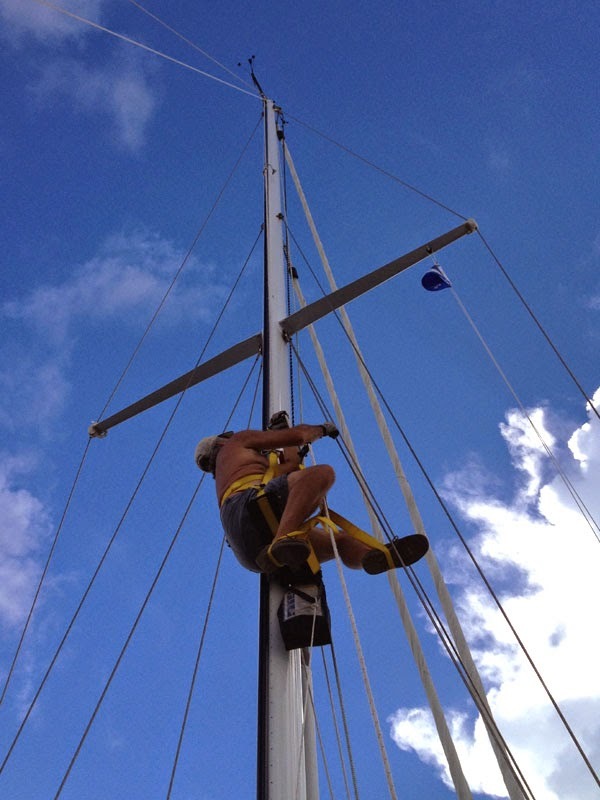 The trick is to release one of the mooring pennants, tie the Floatline to the freed-up cleat, run it across the deck and through the other pennant's loop and then along the outside of the boat all the way back to a fitting on the rail at the cockpit. In this way, a very long bridle is created that holds the boat in place after the second pennant is released. This gives the single-handed sailor time to get back to the cockpit safely to make a controlled departure by simply releasing the Floatline and engaging the engine. The floating line prevents any propeller snags, and it's a simple matter to retrieve the line later with the autopilot engaged. 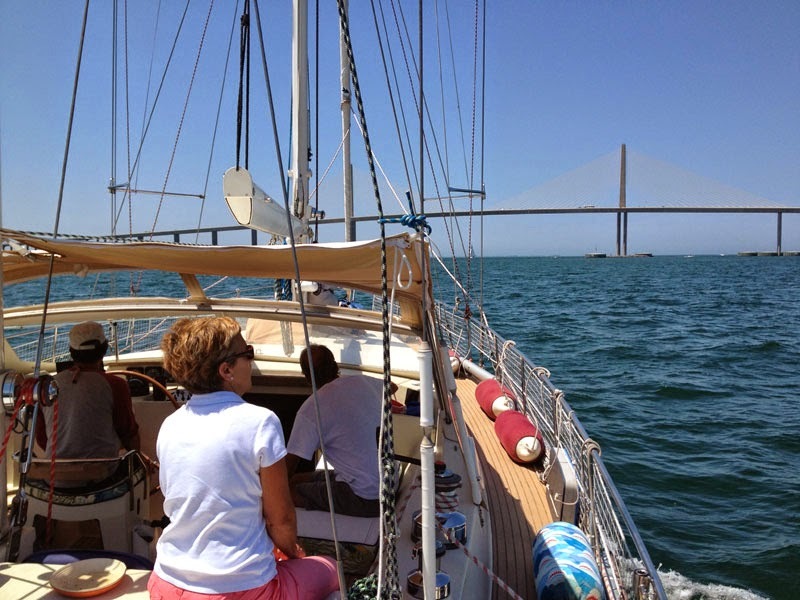 The autopilot really is the key to single-handed sailing on a larger sailboat. 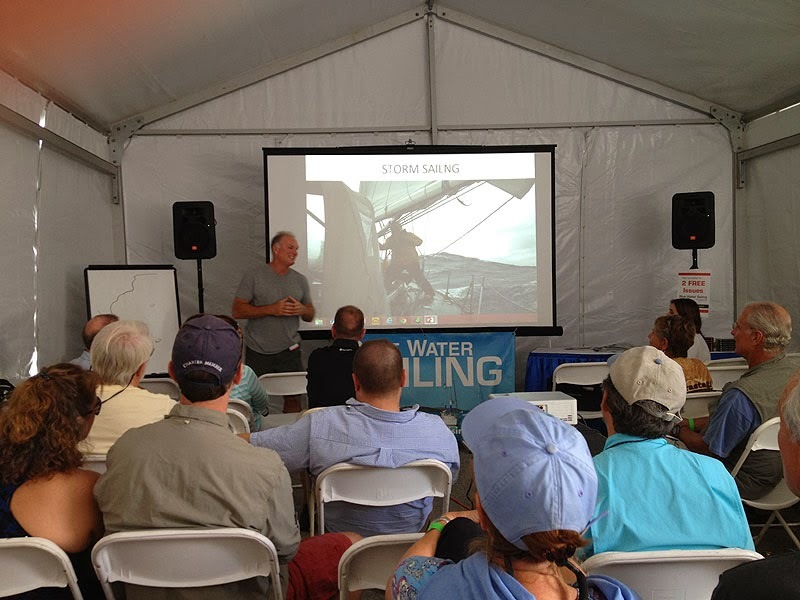 With it, one can head reliably into the wind while raising the mainsail and steer a straight course while attending to whatever else needs to be done. 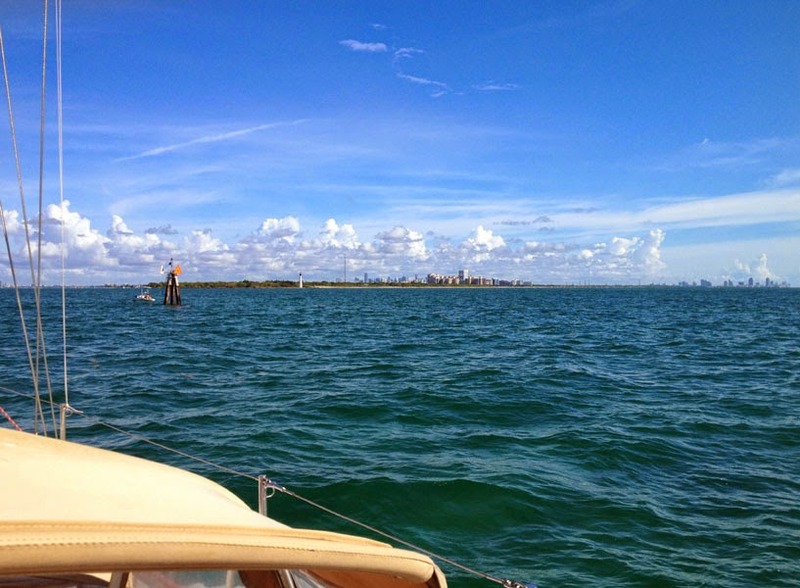 I did just that after motoring out into Biscayne Bay and soon was sailing a nice close reach southward in ten knots of wind. I came about after a half-hour and headed back the way I had come. Nothing to it! 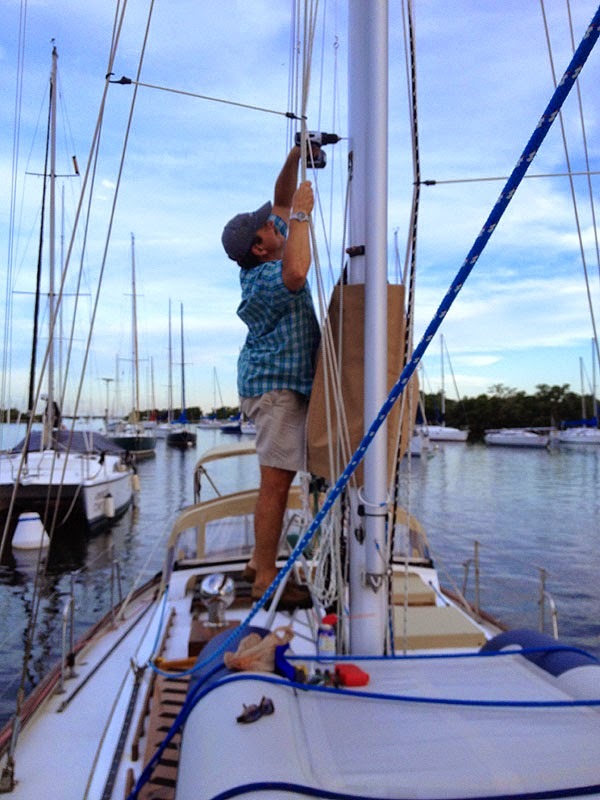 The trick with the line can be done in reverse, picking up the mooring with a boat hook from the cockpit, slipping the line through the pennant loop and then tying off the line to the rail fitting. 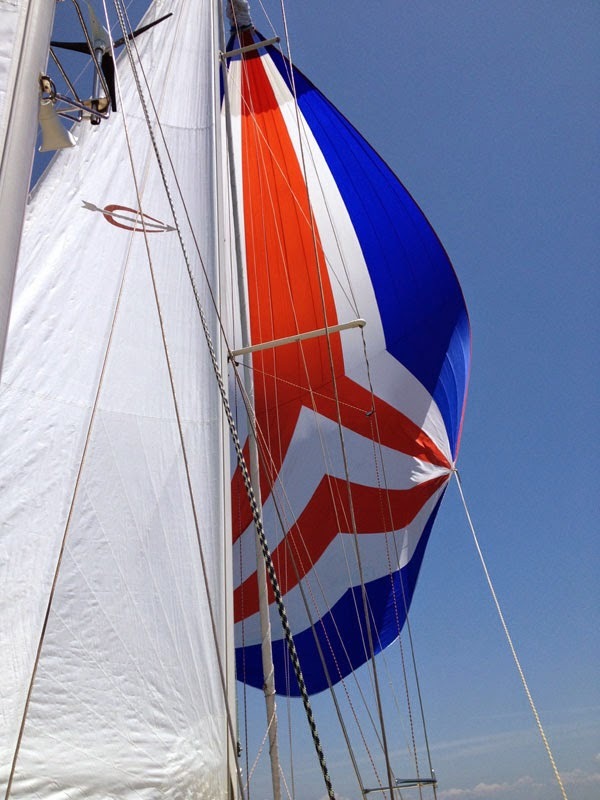 The wind will back the boat up and cause the pennant loop to slide up the line to the bow, where it will hold the boat until one can get forward to secure both pennants. I would try this, but we are so close to the boat ahead of us in the mooring field that we would run into him before I could pick up the mooring from the cockpit. Still, it's a good trick to know about in the event of strong winds or a heavy current. 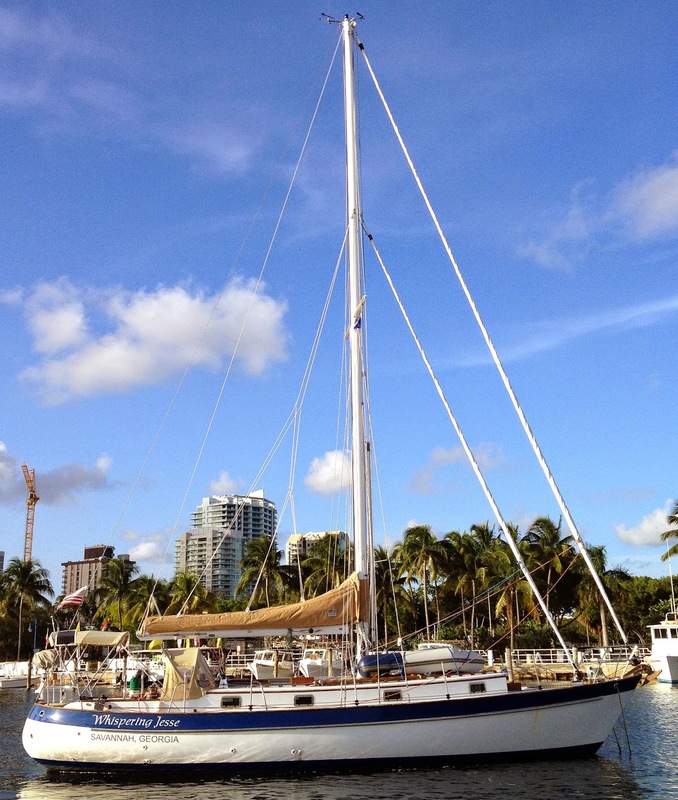 Nan and I have been exploring South Florida during weekends, looking for fun sailing destinations to visit after we get our boat up here from Isla Mujeres, Mexico in early June. 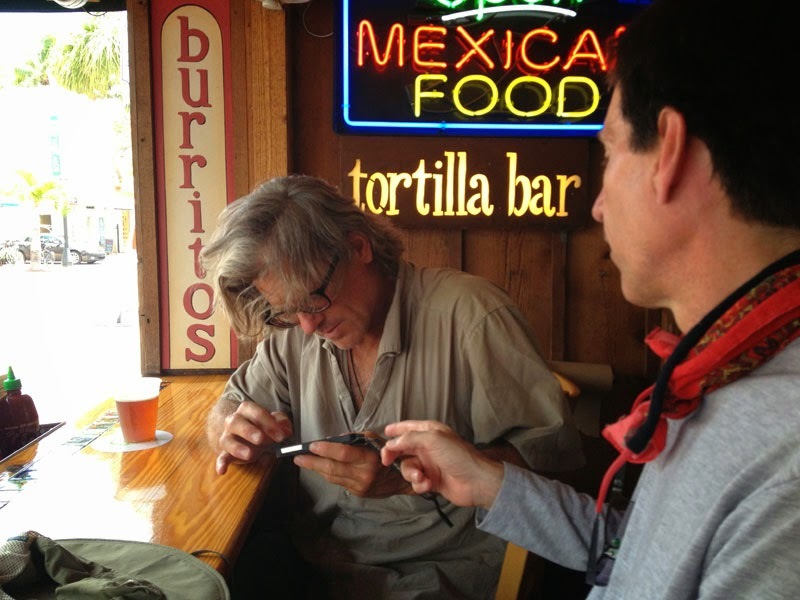 Recently, we drove over the Rickenbacker Causeway to Key Biscayne to check out Bill Baggs Cape Florida State Park. 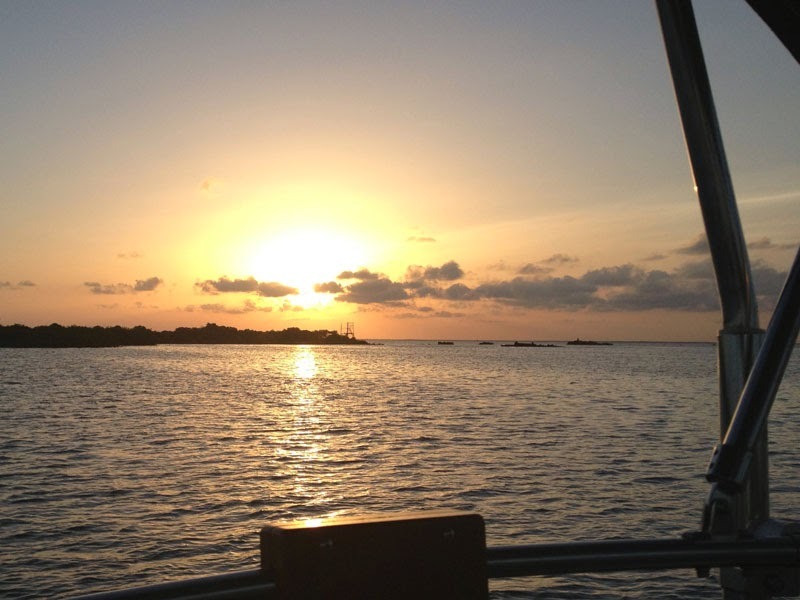 It takes up the southernmost third of the island and features one of Florida's nicest beaches on its eastern shores. We paid our eight dollars at the gate and then proceeded to the farthest west parking lot, which was already starting to fill up at ten o'clock on a Sunday morning. Just past the lot is a sea wall that runs all the way around to where the beach starts. We walked south along its length, observing all the families out fishing and picnicking together. 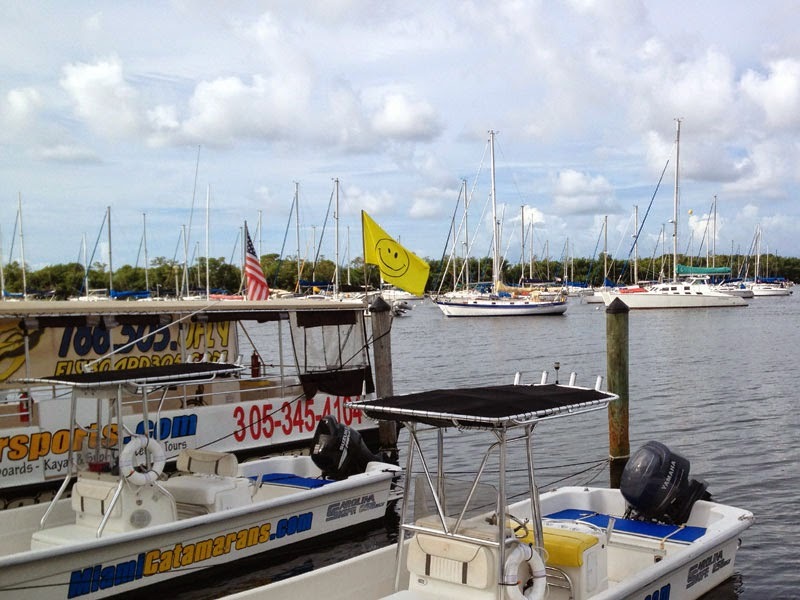 According to Google Maps, the Cape Florida Anchorage is right off the southwest shore, but there were no boats anchored there that day, though there were plenty of motor boats and sailboats cruising by. There seemed to be too much traffic and too many wakes to make for a pleasant overnight anchoring spot. We stopped at an informational sign to learn about Stiltsville, the small cluster of now-abandoned houses built on stilts above the water that one can see about a quarter-mile offshore. The original one was built as a speakeasy back during the Prohibition era, and others followed up until the 1960s. They have managed to survive some terrible weather, but even from a distance, they don't look overly habitable. 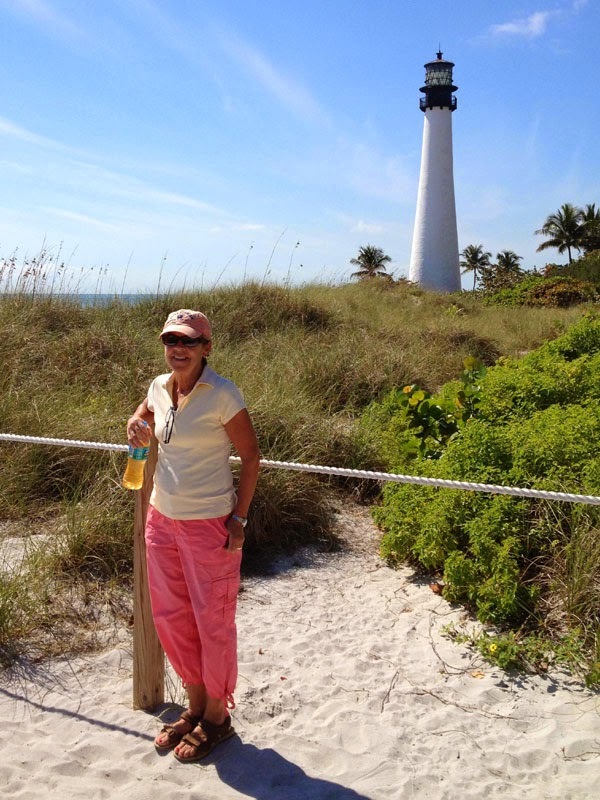 Around the eastern corner from the southernmost point in our walk, we reached the Cape Florida Lighthouse. It was built in 1825 and is the oldest surviving structure in South Florida. It is possible to tour the lighthouse and the light keeper's residence with a guide, but we did not arrive at the scheduled time. It occurred to me looking up from the base that we could probably see the lighthouse from the roof of our apartment building across Biscayne Bay, which turned out to be true. We just hadn't realized what we were looking at before then. The beach was indeed nice. We kicked off our shoes and walked in the sand and surf at the water's edge. People were swimming, but the water was a little too chilly even for wading. We took one of the boardwalks back to the easternmost parking lot and followed it along the way we had driven in until we reached the Lighthouse Cafe, where we stopped to eat lunch. My conch fritters were fine, but they came with cocktail sauce instead of a remoulade sauce. Nan had the shrimp basket but didn't like it much, and the table service was irritatingly slow. 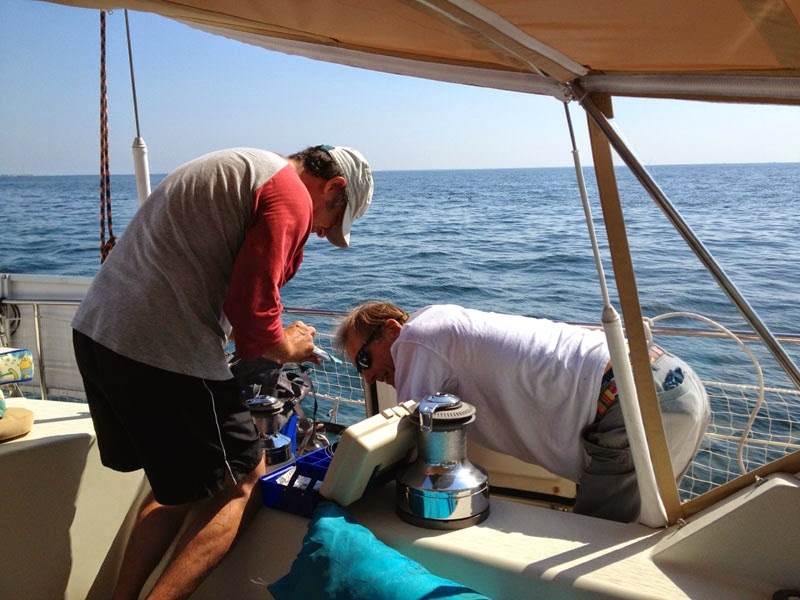 We returned to our car and drove back the way we had come in until we reached the turn-off for No Name Harbor. We didn't know what to expect, but the whole establishment was impressive, from the size of the harbor itself to the long concrete quay and the Boater's Grill restaurant. 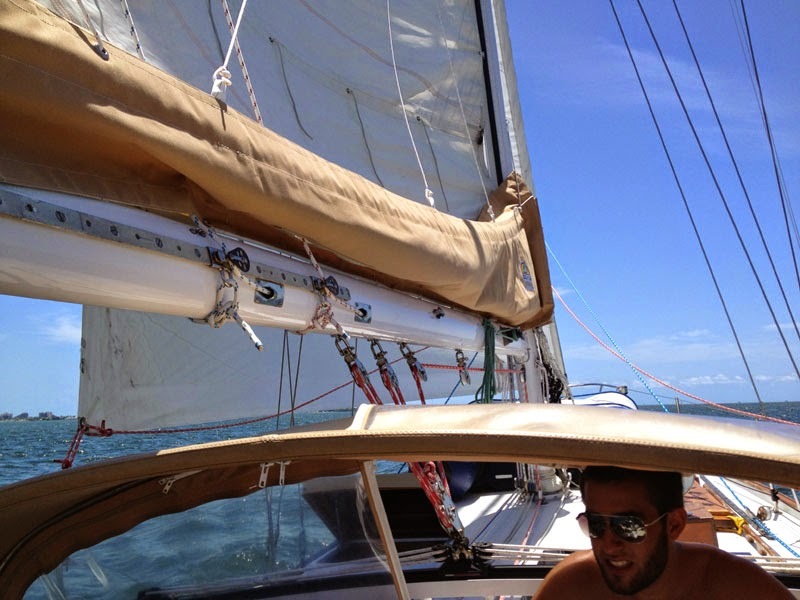 It was definitely the kind of place we could see ourselves sailing to for a day or an overnight stay. Others must agree, because the place was packed with boats along the quay and anchored just offshore, and there was a waiting list at the restaurant. We hadn't taken Scout with us that day because dogs are not normally permitted in state parks, but they are allowed at this park, except on the beach and in the restaurants. That works just fine for us. Nan, Scout and I are just coming off some family time here in Miami. 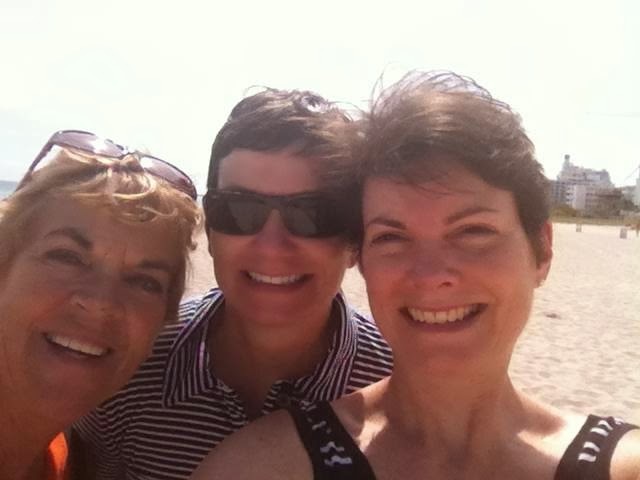 My sisters Jane and Susan arrived last Sunday and split their time between here and Key West. We picked Jane up from her red-eye flight from Seattle early on Sunday morning and spent the day touring around town, driving all over Coconut Grove and Coral Gables to show her the Coconut Grove Sailing Club, Matheson Hammock Park, the Biltmore Hotel and golf course, the Miracle Mile, and Little Havana, where we ate a late Cuban lunch at the Versailles Restaurant. After regrouping at our apartment, we drove Jane downtown to the Aloft hotel in Brickell, where she and Susan would be staying. Our little one-bedroom apartment is too small for overnight guests. Susan's flight was delayed, but we still managed to pick her up at the airport and get her to the hotel for the start of the season finale of Downton Abbey. On Monday, while I was back at work, Nan took the train downtown to meet Jane and Susan for the Big Bus Tour of Miami Beach, a fun thing to do that she and I enjoyed a few months ago. 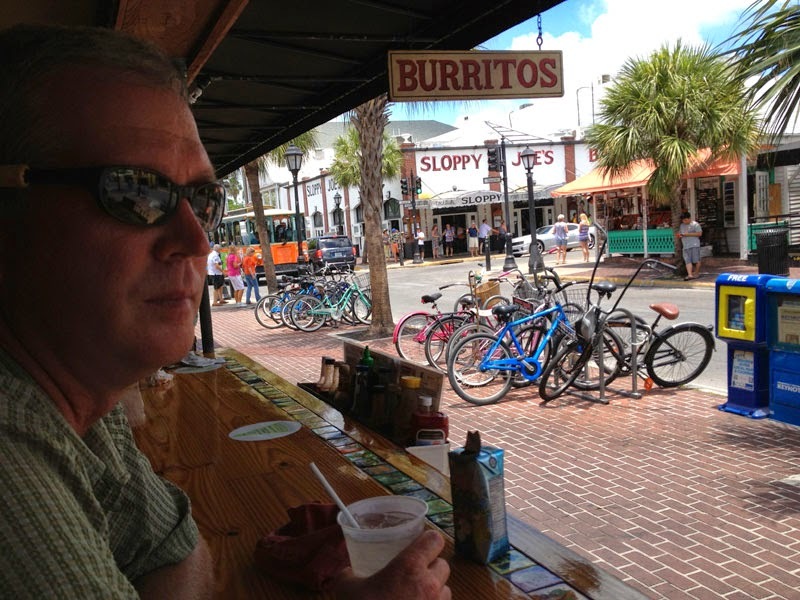 They got off the bus at one of the stops near the beach to walk in the sand and eat lunch at a sidewalk cafe. Instead of continuing the same tour, they switched to the Coconut Grove/Coral Gables loop and ended up at Cocowalk, just a few blocks from our apartment. The next day, Jane and Susan rented a car and drove down to Key West to spend time with our cousin Hilary, who has lived there for many years. She met them for dinner at Louie's Backyard restaurant, the same place we met her when we were there in 2002. 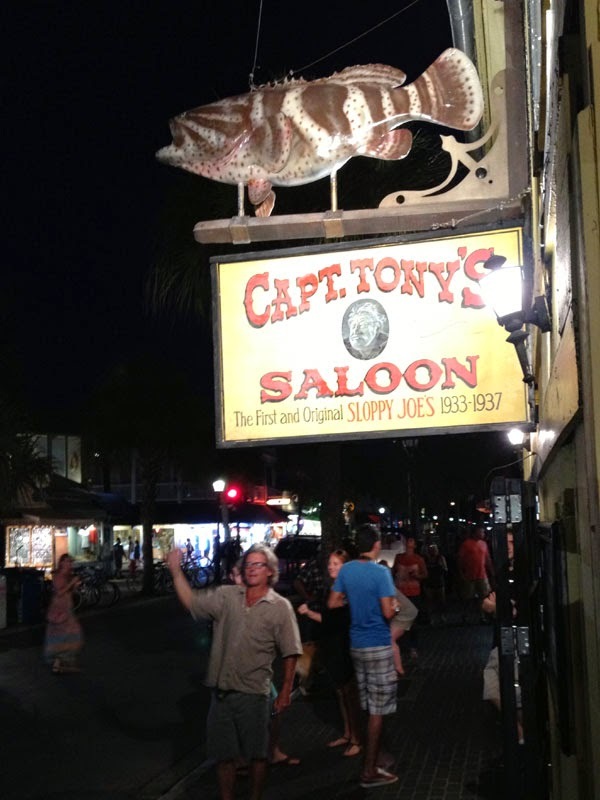 I only saw the photos but it looks like my sisters did all the touristy things people do in Key West, like visiting the Hemingway House and Sloppy Joe's, and walking around Duval Street and Mallory Square. Mom and Dad drove down from Savannah on Thursday and checked in to the Hampton Inn next door. Jane and Susan returned shortly after, and the four of them came over for Nan's Thai chicken in peanut sauce. We needed to move the furniture around and add in our outdoor cafe table, but we were all able to sit around the table together for dinner. Our visitors waited for the drizzle to clear the next day before heading over to Vizcaya, the hundred-year-old bayside estate of James Deering, an heir to the International Harvester fortune, who split his time between Chicago and Miami. Nan and I toured the estate ourselves recently and were suitably impressed. Mr. Deering had traveled the world in the early 1900s to find the best of everything, and he brought it all together in his beautifully designed mansion. We had done the very worthwhile audio tour, but our visitors opted for the guided tour and then followed it with lunch at the estate's cafe. For dinner that night, we treated at the Coconut Grove Sailing Club, accompanied by soulful tunes from the Jazz Monkeys. Saturday morning, the whole group repeated much of the tour we had given Jane the previous Sunday and ended it at a Nicaraguan restaurant on Calle Ocho in Little Havana, The Guayacan. Lunch was good and filling, and we returned home to regroup before the arrival of cousin Hilary from Key West, and Uncle Pat and Aunt Marilyn from Bonita Springs, whom we had not seen in a dozen years. We all met up at the Hampton Inn's pool to get reacquainted and then trooped over to our apartment for cocktails and a trip up to the rooftop pool for views of downtown Miami and Biscayne Bay. By then, it was dinnertime and we walked around the corner to Berries, our favorite restaurant and watering hole. The accommodating staff there set up a table for all nine of us and informed us that it was lobster night. There were several takers, including me. Back at our apartment, Nan unveiled the banana cake she had baked for a late celebration of my mother's eightieth birthday. We lit the candles, sang Happy Birthday to You, and cheered when Mom blew them all out. 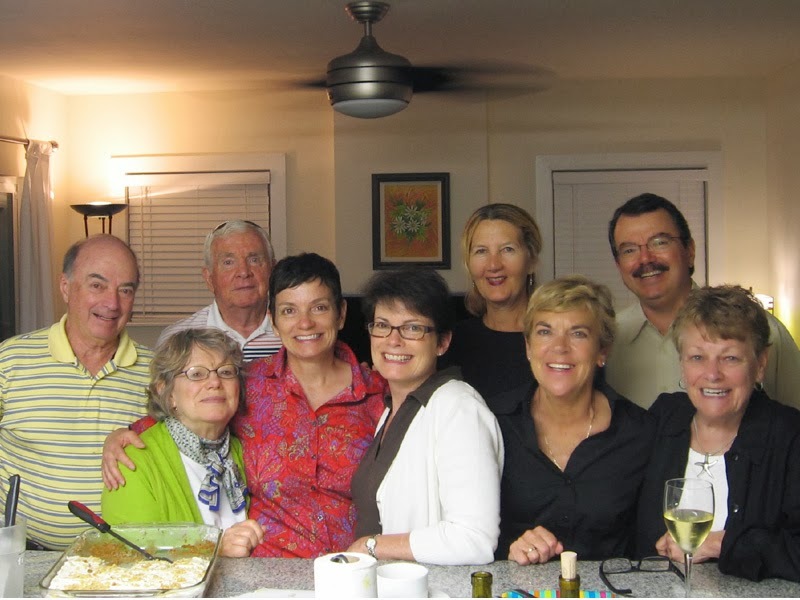 Wine glasses were refilled, toasts were made, and everyone agreed that we needed to get together like this more often. With more than a few of us having ties to the Southeast now, that should be easy to do.